The area around Buckley in north Wales has been associated with the production of pottery since the 13th or 14th centuries. Nineteen different pottery sites have been identified, producing a wide range of ceramic wares in the six-hundred year period up to the mid-20th century. In the 17th and 18th centuries, many of the wares produced were of high quality, on a par with Staffordshire wares of the same date. In the early 17th century, the technique of sgraffito decoration spread to north Devon and Somerset from mainland Europe. Buckley is the only known site to produce early sgraffito wares in northern Britain. This article aims to establish the date of the production and range of early sgraffito wares at Buckley and to examine the derivation of the designs and illustrations on the vessels. An illustrated catalogue has been produced and a comparative study made of sgraffito wares elsewhere to place Buckley into a national and international context. The results show that early sgraffito production at Brookhill pottery, Buckley, was between 1640-1720. Of the excavated pieces, 62% were made between 1640-1680, and the number of sherds by vessel number is also greater within that date range. All the vessels are dishes. The form and designs on the remainder of the sherds, dated up to 1720, are no different from those dated to 1640-1680, which suggests a continuous period of production. The most common themes on the pots – tulips, leaves, mottoes, animals and birds – relate very closely to the designs featured on other objects made in the same period such as textiles, wallpaper, furniture and manuscripts. Some of the designs were available in pattern books for particular groups of objects, for example needlework and pastry decoration. There is an interesting sub-group of pieces with animal and bird motifs and mottoes on the rims. It is possible that the influence for these came from a resurgence of interest in the medieval bestiary texts and illustrations in the 16th and 17th centuries. The less specific designs such as circles, slashes and zigzags could have been personal expressions of the potters themselves. 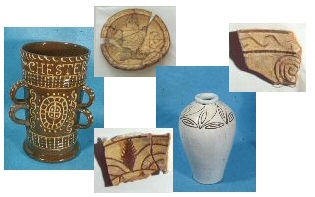 The sgraffito technique of decoration on pottery spread through trade from east to west, reaching Italy in the 12th and 13th centuries and filtering through to Britain via south-west France and northern Europe. Decorative styles found at Buckley occur in most production areas. These are plants, fish, birds and geometric patterns. Mottoes and inscriptions appear on pieces from four centres, including Buckley. The most common vessel forms throughout Europe are dishes and bowls. No Buckley sgraffito has been found outside Buckley itself, although Buckley black-glazed wares have been tentatively identified in the eastern states of north America and locations around the Irish Sea. The problem with ascribing this provenance is that similar wares were also produced in other areas such as Merseyside and Staffordshire. Further research is required to determine the distribution of all Buckley wares. Key Features: The first published catalogue of 17th century sgraffito wares in northern Britain, Explores the influence of 17th century designs in other materials on pottery production, Searchable image database of sgraffito sherds from Buckley.